The line-up for the Pontefract v Newcastle match promised much and attracted a full house, bolstered by the vociferous Newcastle support. 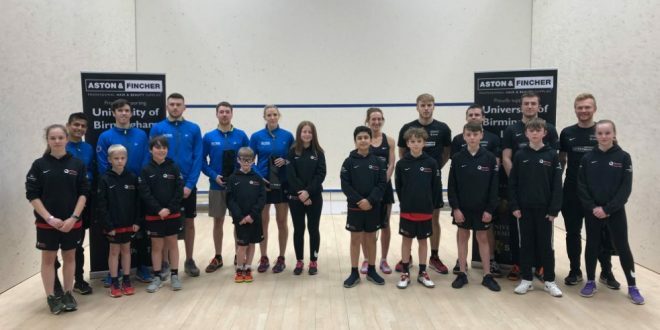 The players were introduced on court accompanied by Pontefract’s future stars: the very promising 8 year old Fearne Copley, Logan Willstrop/Atkinson; Emmie Beachill, Oscar Johnson and James Barker. Patrick Rooney gave Pontefract a start beating the promising 17 year old Max Forster 2-0, but the all Dutch clash between World Over 35 champion Laurens Anjema – soon to head for Manhattan to coach – and Piedro Schweertman went Newcastle’s way 2-1. Chris Simpson, error ridden in the first, lost it 11-5 but did well to steady the ship to win 2-1 against Alan Clyne. 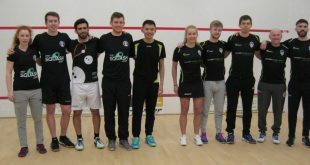 Laura Massaro beat Lisa Aitken to win the match for Pontefract and it was left to James Willstrop and Cameron Pilley to round the night off, which considering the lateness of the hour they did in style with a quality match. 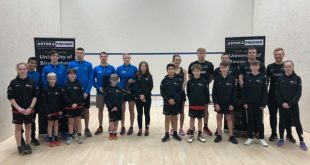 Pilley won a tight first, Willstrop levelled 11-9 and it was he who edged home 11-9 – apparently under the mistaken impression that the outcome of the match depended on him. It all ended at ten past 11, another PSL night which did nothing but good for the game. The reigning PSL champions had another glorious evening at home when they overwhelmed Bexley 5/0 in front of a full house, to maintain their unbeaten record. 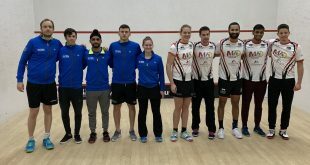 It is only fair to point out that Bexley lost a couple of their players, but especially their number one Mohamed Abouelghar, the world number 10 who was due to play our world number one Mohamed Elshorbagy. With the rules now changed to play best of three rather than five, spectators get a more dynamic evening and those matches that used to reach midnight are a thing of the past. The players have to get into their stride very quickly to get a chance at victory. The St. George’s number five Jasmine Hutton failed to do that against Kace Bartley and found herself 8-2 down in the first game. However she did not allow the situation to damage her confidence and was soon using her pace and her arsenal of shots to pull back. As her points mounted up so Bartley’s confidence faltered and she made crucial errors that helped Jasmine to pull level and go on to win the game 12-10, a result she should always be proud of. Jasmine started the second game with two outright winners and it was obvious that she had the power – boy can she hit the ball hard! – and the shots to beat her opponent. She led all the way through to 10-10 with Bartley never more than two points behind. At 9-9 she hit the ball out of court to put Jasmine at match ball 10-9 but then Jasmine in her haste to finish it off made an error to put the score at 10-10. 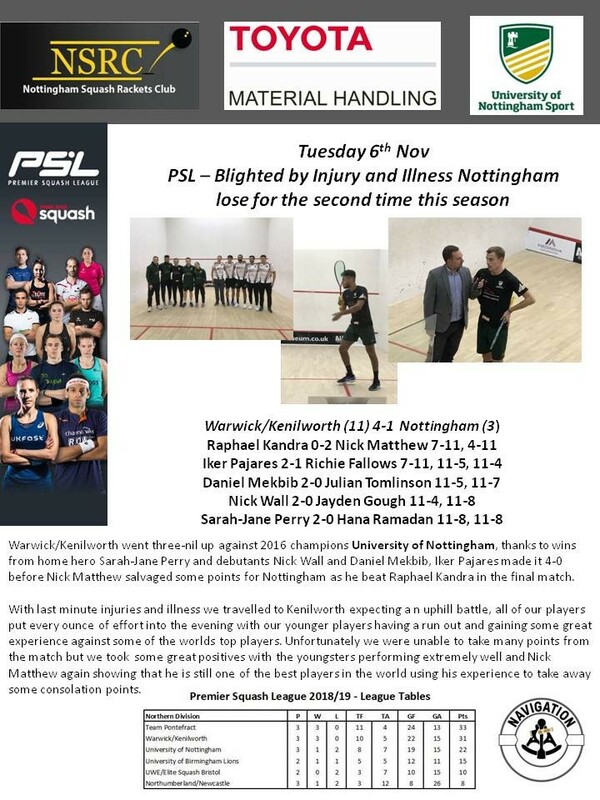 She then hit a perfect forehand drop to get to match ball again and Bartley finished the match with a backwall boast than never reached the front wall. First blood to St. George’s. Next up was Robbie Temple for the home club against Brad Masters. It was a scrappy start littered with strokes and errors with Masters settling down to a 6-2 lead. But Temple has seniority, used his experience to time his drop shots well and pulled up to 6-6 and then going ahead to win the game 11-7. While Masters could drive to length well he failed to show any real danger at the front of the court. In the second game it was Temple who took control from the outset and reach a 6-2 lead with a fine group of drops and penalty strokes because Masters never quite cleared from his own shots. Temple never looked troubled as he went on to win 11-5. Leading 2/0 St. Georges were sitting pretty but along came Ruis Soares for Bexley and put up a terrific fight against Sebastien Bonmalais , our French number three, currently ranked 90 in the world. 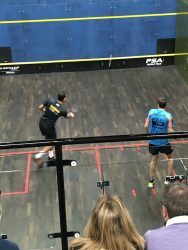 He moved like lightning and although the game was dictated by Soares, Sebastien kept his head and played solid squash. It was Soares love of the boast from all over the court , but especially the back that was his downfall as the tin rang out his errors to give Sebastien the first game 11-6. The second game was the highlight of the night as both players mixed their shots and put together some breathtaking rallies that covered every inch of the court. Leading 9-8 Soares lined up to hit a ball near the service box and missed completely: the ball had hit a sweat spot on the floor and skidded away. At 9-9 it was still anybody’s game and they traded point for point up to 12-12. Sebastien then hit the ball out of court twice in a row to give Roares the game 14-12 and tie the rubber. 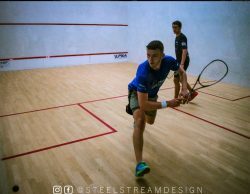 While Soares started the deciding game with winners, his boasts, mostly forehand from the back of the court, let him down and the errors just piled up for Sebestien to cruise away to an 11-8 win for the victory and earn St George’s the match. But we still had Tom Richards facing Olli Tuominen, the veteran Finnish champion who must surely be into his fifth decade by now. 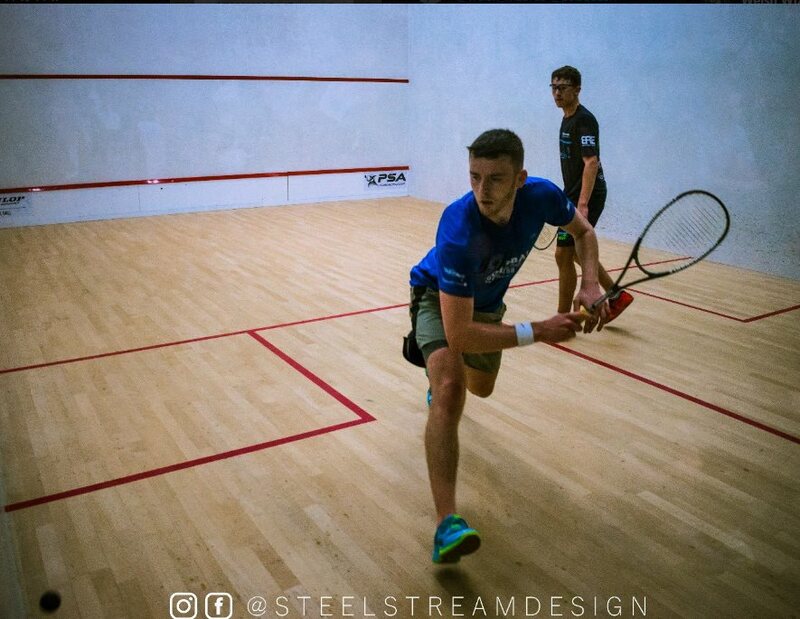 Tom ran away with the first game 11-2 as Tuominen got used to the court. In the second game the Finn was now grooved in and gave Tom a terrific fight; Tom was rattled as he demonstrated whenever he made an error. Trailing 8-9 there was still every chance of Tom finishing it in two but Tuominen hit a beautiful straight nick to get to game ball and followed it with a perfect length which Tom had no chance of picking up. 11-8 to Tuominen and Tom was not pleased with himself. In the break he must have given himself a good talking to because he took charge from the first serve and made just one error on the way to an 11-6 win to take the rubber 2/1. 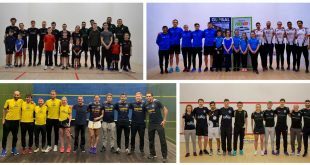 And so to the number ones: we had Mohamed ElShorbagy the world number one, Bexley had Josh Masters the world number 53. A mismatch? Well from the first it was all Elshorbagy as he won the first game11-0. In the second game Masters was bolder and started to force errors from the world number one. Indeed Masters got to game ball 10-9 with a backhand drop shot to show that he also had an attacking game.Sadly the next rally ended with a stroke in Elshorbagy’s favour to make the score 10-10. Another stroke to ElShorbagy to put him at match point and he took the last point to finish the evening. Masters should b e proud of his performance against such an experienced player . St. Gorge’s finished the night with a 5/0 whitewash go forward to their next game in Wales with confidence. The next PSL home game is December the fourth Put it in your diary.